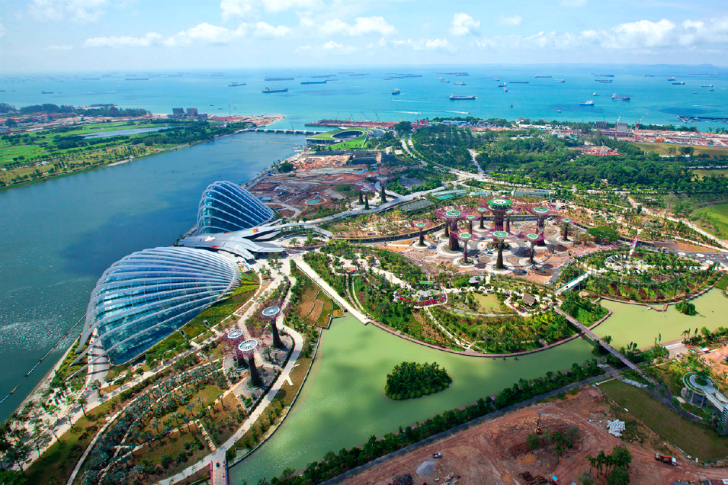 Singapore's extraordinary Gardens by the Bay opened in the summer of 2012, and we are still blown away by the park's amazing design. Among the project's highlights is a pair of carbon neutral conservatories - one of which is the largest climate controlled greenhouse in the world. Designed by Wilkinson Eyre, the Flower Dome and Cloud Forest make use of passive and active sustainable technologies to create the perfect micro climate for exotic plants to grow. 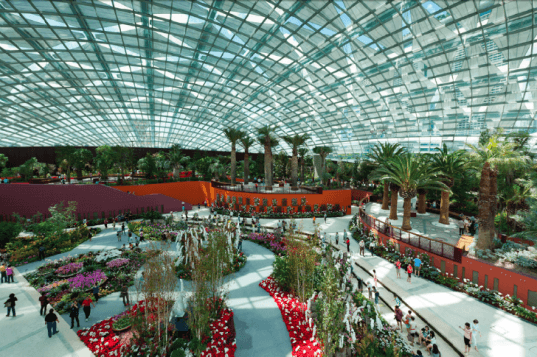 The cooled conservatories at Gardens by the Bay cover an area of 16,500 m2 and achieve carbon neutral status with the help of low-energy and renewable systems. The two greenhouses were designed by Wilkinson Eyre and sit at the north end of the marina. Each building has its own distinct climate – the Flower Dome has a cool-dry zone with a Mediterranean feel, while the Cloud Forest is a cool-moist biome with a giant tropical waterfall inside. Each showcases a different range of plants – the Flower Dome exploring issues between people and plants and the Cloud Dome highlighting how climate change and destruction of tropical cloud forests will threaten the Earth’s biodiversity. In order to successfully operate these greenhouses in an energy-efficient way, Wilkinson Eyre had to design sophisticated systems. The envelopes are the key to the whole operation; the myriad glass panels act to let in light while reducing solar heat gain. Low-e panels take in approximately 65% of the incident daylight, but only 35% of the solar heat. Cool, dry air is introduced near the bottom of the greenhouses amongst the plants and people, while hot air rises up and out of the structures or is directed back into the system for other processes, like dehumidifying. The nearby solar trees act as vents to expel hot air out and also generate hot water and electricity for the entire complex. Rainwater is collected off the greenhouses, stored and then used for irrigation. An on-site biomass boiler provides heat and electricity and is fueled entirely with green waste from the parks. The greenhouses are just one aspect of the spectacular gardens and recently received the World Building of the Year, WAF Awards 2012 and the BCA Green Mark Platinum 2012. The cooled conservatories at Gardens by the Bay cover an area of 16,500 m2 and achieve carbon neutral status with the help of low-energy and renewable systems. The two greenhouses were designed by Wilkinson Eyre and sit at the north end of the marina. Each building has its own distinct climate - the Flower Dome has a cool-dry zone with a Mediterranean feel, while the Cloud Forest is a cool-moist biome with a giant tropical waterfall inside. Each showcases a different range of plants - the Flower Dome exploring issues between people and plants and the Cloud Dome highlighting how climate change and destruction of tropical cloud forests will threaten the Earth's biodiversity. In order to successfully operate these greenhouses in an energy-efficient way, Wilkinson Eyre had to design sophisticated systems. The envelopes are the key to the whole operation; the myriad glass panels act to let in light while reducing solar heat gain. Low-e panels take in approximately 65% of the incident daylight, but only 35% of the solar heat. Cool, dry air is introduced near the bottom of the greenhouses amongst the plants and people, while hot air rises up and out of the structures or is directed back into the system for other processes, like dehumidifying. The nearby solar trees act as vents to expel hot air out and also generate hot water and electricity for the entire complex. Rainwater is collected off the greenhouses, stored and then used for irrigation. An on-site biomass boiler provides heat and electricity and is fueled entirely with green waste from the parks. The greenhouses are just one aspect of the spectacular gardens and recently received the World Building of the Year, WAF Awards 2012 and the BCA Green Mark Platinum 2012. Gardens by the Bay sustainability strategies.